We’ll be providing the results from our Membership Renewal Survey and offering a new "How to" Guide to Membership Renewal later this month. 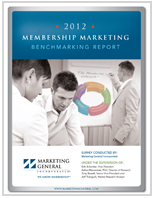 But in the meantime, here’s a look at the 2012 Membership Marketing Benchmarking Report from Marketing General Incorporated (MGI). What is surprising, is the continued downward trend since 2009, shown by networking and access to specialized/current information. This contrasts with the upward trend reported for advocacy and continuing education. If you’d like information on member engagement in activities; how much associations are spending on renewal efforts; specifics on changes in membership; and much more, you can request a copy of the 2012 Membership Marketing Benchmarking Report - here. We’re also developing a Membership Renewal Guide that will be available in our Membership Knowledge Hub later this month - offering tips and advice about renewal for small associations and other membership organizations. Tony: You're welcome - the report is full of great insight. We'll be sharing more of the data in our "How to Manage Membership Renewal" guide which we'll be launching later this month.